beer gardens and so much more. This year the Poetry Stage will be even bigger and more exciting than last year! We will have fully shaded tents for audience and readers! You can bask in the sun if you like, but shade will be available this year! Plenty of chairs in the audience area also. We will have fun and exciting readers and performers! Joy McDowell, Nicole Taylor, Roy Seitz. Dan & Eve King-Lehman, Phil Crowe, Leo Rivers. —Adult poetry & spoken word open mic on Saturday. Sign up for your moment in the sun (and along the Willamette river!). 12:00 Noon - 1:20 PM. and other K-12 young writers wax poetically! 1:20 PM - 2:00 PM. Ridgeline Montessori Middle School's student ukulele group, led by their teacher, Jon Labrousse, redefines the 'Middle School Concert' experience. For complete updates and developments, stay tuned to this page. Do you know any K-12 writers who would be interested in participating in our Sunday youth events? The Poetry Stage @ Festival of Eugene? 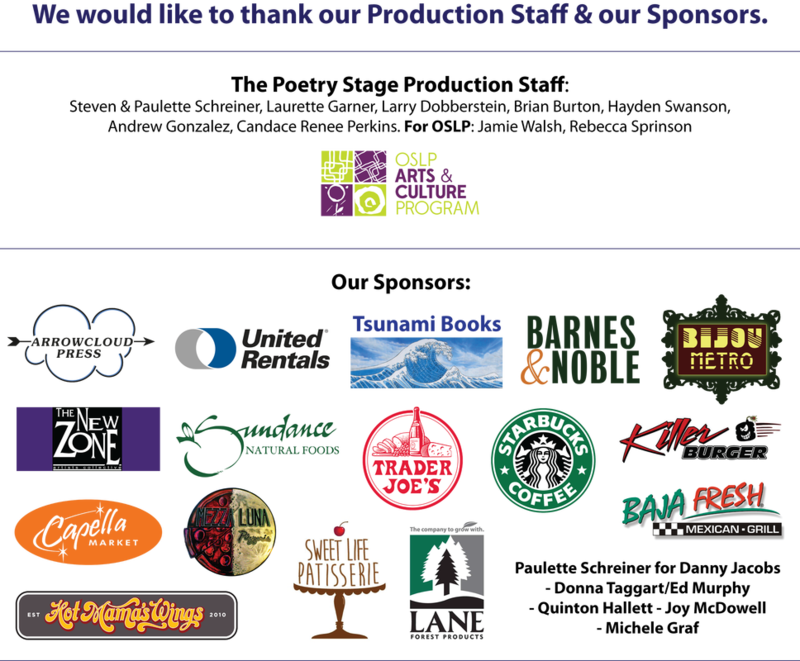 We are looking for sponsors and donations of any kind, to help us cover our operating costs and to help a wonderful and worthy local cause, the OSLP Arts & Culture Program (http://www.artsandcultureeugene.org/about.html).